Welded wire mesh is the term given to the kind of barrier fencing that is manufactured in square or rectangular mesh from steel wire, welded at each intersection. Welded wire mesh, or welded wire fabric, or “weldmesh” is an electric fusion welded prefabricated joined grid consisting of a series of parallel longitudinal wires with accurate spacing welded to cross wires at the required spacing. Machines are used to produce the mesh with precise dimensional control. The product can result in considerable savings in time, labour and money. The welded wire mesh is a metal screen that is made up of low carbon steel wire or stainless steel wire. Welded wire mesh is available in various sizes and shapes. It is widely used in agricultural, industrial, transportation, horticultural and food procuring sectors. It is also used in mines, gardening, machine protection and other decorations. Welded wire mesh is usually affixed to steel uprights. Welded wire mesh is a relatively cheap fencing solution but has the advantage over chainlink wire of not bending so easily and not being so easily cut. Welded wire mesh is therefore ideal where a low level of security is required but where chainlink fencing is too easily overcome. Welded wire fabric (WWF) is also sometimes used in reinforced concrete, notably for slabs. Our product range includes a wide range of Welded Mesh such as Mild Steel Welded Mesh and Welded Wire Mesh. 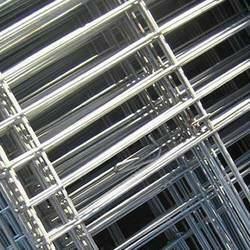 We offer a qualitative range of Mild Steel Welded Mesh in the industry. They are resistant to manufacturing defects and designed as per the convenience of the user. We assure our clients that our Mild Steel Welded Mesh will give trouble free performance to the user as they are developed using the superior quality of raw material. We acclaimed prominent position in this industry for our superior quality product range.